They may be way too old for this, but it looks like Riggs and Murtagh could be making a return to the big screen after nearly 20 years away. That's right, everyone. It looks like Lethal Weapon 5 may actually happen. 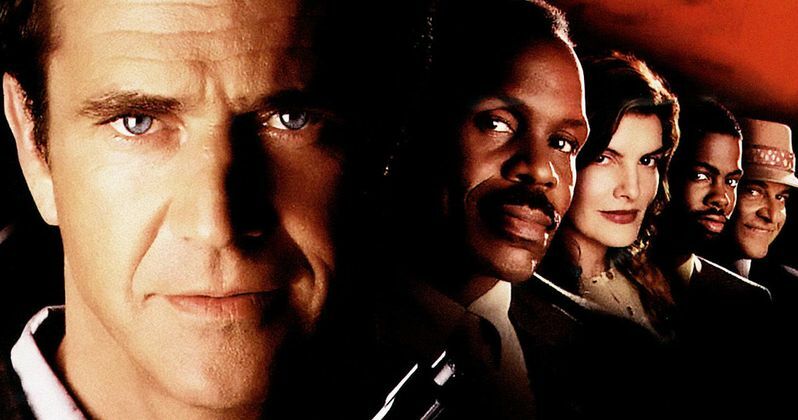 A new report claims that Mel Gibson and Danny Glover are both in discussions with Warner Bros. about it. What's more is that Richard Donner, who directed the original Lethal Weapon, is set to direct as well. This potential sequel would also see Channing Gibson (Lethal Weapon 4), returning to write the script. The report claims that the team is "on board" and are all "huddling on the possibility" of doing Lethal Weapon 5 right now with Warner Bros. It doesn't sound like a deal has been officially made yet, but the talks are happening and we very well could see one last entry in the very successful cop movie franchise. Lethal Weapon 4 came out in 1998, so at the very earliest, it would be 20 years since the last movie came out. To put that in perspective, the first Lethal Weapon was released in 1987. So all four movies were released in an 11-year time span. Danny Glover's character famously remarks, "I'm getting too old for this s***" in the movie. If that was true 20 years ago, it's true for everyone now. Danny Glover is 71-years-old, so his ability to do an action movie is certainly limited. Mel Gibson is 61-years-old and has been doing some action movies lately, so he's more capable, but still past his prime for a Lethal Weapon movie. Richard Donner is the real X-factor here, as he's 87-years-old and hasn't directed a movie since 16 Blocks in 2006. Related: Chris Hemsworth to Star in Lethal Weapon Reboot from Fast & Furious Director? Why now is the time remains a bit unclear, but this isn't the first we've heard of Lethal Weapon 5 over the years. At one point, it was being eyed as a reboot. At various points, it was in development with Gibson and Glover and at another, the project was labeled as "dead in the water." Shane Black, who wrote the original Lethal Weapon, revealed last year that he wrote a lengthy treatment for Lethal Weapon 5 that was ultimately scrapped. "I wrote a 62-page treatment with my friend Chuck for 'Lethal Weapon 5' that would've been, I think, a very good movie. It was interesting. It was essentially an older Riggs and Murtagh in New York City during the worst blizzard in east coast history, fighting a team of expert Blackwater guys from Afghanistan that's smuggling antiquities. And we had a young character that actually counter-pointed them." To date, the Lethal Weapon movies have brought in $955 million at the worldwide box office. The franchise has remained popular and Mel Gibson is currently having a bit of a career revival. So, despite everyone being pretty old for an action flick, this could possibly work. As Deadline notes, there are "a lot of moving parts" and nothing is final yet, so don't get your hopes up if you're looking forward to this. But it's a seemingly strong possibility Lethal Weapon 5 is going to be a real thing.